This is my most utterly favourite snack and so simple to do! I have a friendly local butcher in Stornoway and he happily gives me pig fat for free, so our home is well stocked with these delicious little nibbles 24/7, and they will definitely be on the menu if you are visiting us for one of our sporting breaks. I always make sure I’ve got a pocketful when out on the hill. I haven’t stipulated amounts as it completely depends on the amount of meat you have, but just stick to the ratio of salt I’ve given you and check on them at 30 minute intervals in the oven – if you’re cooking smaller quantities of skin it will obviously crisp up more quickly. Weigh your pig skin and write it down. Make up your brine by measuring out 10% of the skin weight in salt, add enough water to later cover the skin and stir. Chop your pork skin into pieces 1cm wide by 5 to 6 cm in length. Place your cut up pig skin in a steel container and cover with the brine. Then put the brined meat in the fridge overnight. The next day, preheat your oven to 200c, 390F, Gas Mark 6 (or use the top oven of a Raybern or Aga). Drain off the water and place the pork skin in a roasting tin, then place in the oven. 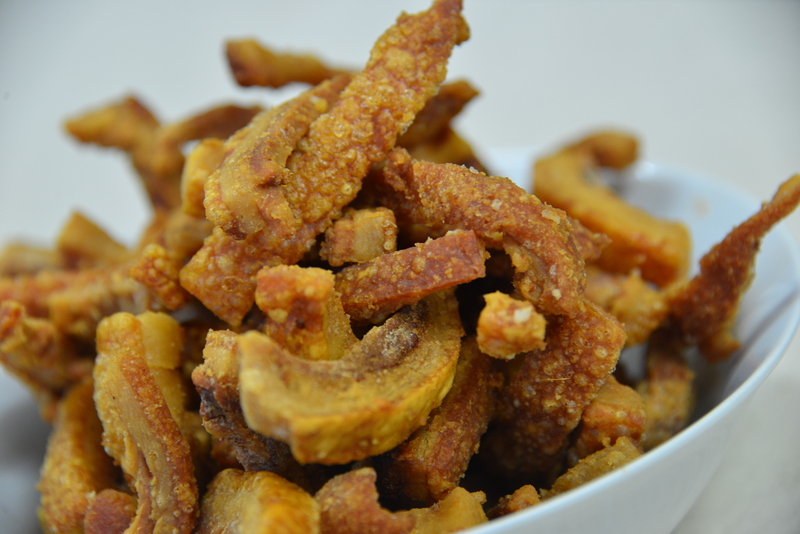 Check on your pork scratchings every 30 mins, give them a little stir and then returning them to the oven for another 30 minute interval. Keep doing this until the fat has stopped bubbling, which means there is no more moisture in them. Leave to cool down for about 20 minutes then enjoy them while still slightly warm, with a chilled larger or delicious hoppy ale in front of a roaring log fire.